He, J., Yuan, T. and Tang, W. (2016). Fusarium graminearum Maize Stalk Infection Assay and Associated Microscopic Observation Protocol. Bio-protocol 6(23): e2034. DOI: 10.21769/BioProtoc.2034. The ascomycete fungus Fusarium graminearum (previously also called Gibberella zeae) causes Gibberella stalk rot in maize (Zea mays) and results in lodging and serious yield reduction. To develop methods to assess the fungal growth and symptom development in maize stalks, we present here a protocol of maize stalk inoculation with conidiospores of fluorescent protein-tagged F. graminearumand microscopic observation of the stalk infection process. The inoculation protocol provides repeatable results in stalk rot symptom development, and allows tracking of fungal hyphal growth inside maize stalks at cellular scale. Maize (Zea mays) is one of the most important crops across the world. The stalk is the main stem of a maize plant. It is composed of nodes and internodes (Figure 1). The internodes comprise rind and pith, and vascular tissues are scattered in the pith. 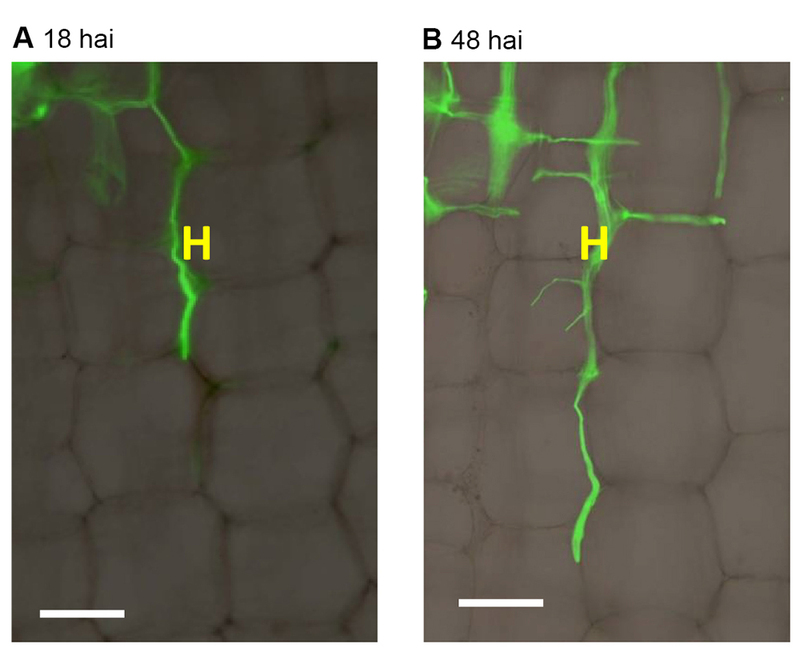 Figure 1 shows the microscopic images of maize stalk sections under bright field or GFP fluorescence channel. This provides context for maize stalk inoculation and observation. The ascomycete fungus Fusarium graminearum (previously also called Gibberella zeae) causes Gibberella stalk rot in maize (Zea mays) and results in lodging and yield loss (Jackson et al., 2009; Santiago et al., 2007). F. graminearumcan also cause seedling blight and ear rot of maize, and Fusarium head blight of wheat and barley (Jackson et al., 2009). In the field, ascospores of F. graminearumoverwinter on infected crop residues such as maize stalks and wheat straw, and may infect other plants through wounds (e.g., caused by hail or pests), or may enter through young roots, and start a new infection cycle (Jackson et al., 2009). Although the entering routes and disease development time course may differ, the final symptom for maize Gibberella stalk rot is in the stalk of adult maize plant, which directly leads to lodging and yield loss. Figure 1. Anatomy of maize stalk. Uninfected internodes of maize stalk at V11 stage shown as reference for understanding F. graminearumprogression. V: vascular bundle. P: parenchyma cells. Green bar = 5 cm; White bars = 100 μm. Compared to the inoculation method for assessing wheat head blight development (Pritsch et al., 2000 and 2001; Proctor et al., 1995), the inoculation method for maize stalk rot is less well established. To assess plant resistance or fungal virulence regarding maize stalk rot, two major types of inoculation methods have been reported. One is inoculation of young roots (Yang et al., 2010), which mimics the route of one type of natural infection, but has great variance in the time before stalk symptoms develop among individual maize plants, which makes follow-up microscopic observations difficult. The other is inoculation of mature stalk by wounding, usually at the internode immediately below the tassel (Zhou et al., 2010; Zheng et al., 2012) or at the internode immediately above aerial root node (Reid et al., 1996; Santiago et al., 2007) and then assessing lesions after 14 days. 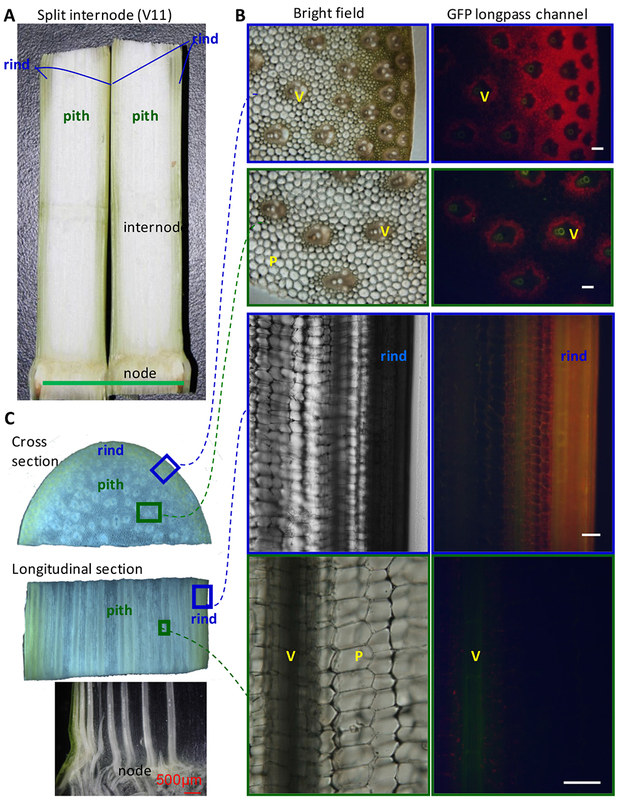 Recently we reported a method of wounding inoculation of maize stalks at lower internodes in combination with fluorescent protein-expressing fungi, which provided more synchronic symptom development for microscopic tracking of the infection process at the cellular scale (Zhang et al., 2016). Fungal strains: The F. graminearum strain PH-1 expressing fluorescent protein AmCyan under the promoter of VM3 from Neurospora crassa (AmCyanPH-1) (Yuan et al., 2008; Zhang et al., 2012). Plant material: Maize (Zea mays ssp. mays L.) cultivar B73 plants (Schnable et al., 2009) were cultivated in a phytotron at 22-26 °C with 65% relative humidity and a 14 h photoperiod for 8 weeks until the tenth leaf appeared. Note: Operations in Procedure A should be carried out in a biological safety cabinet that has been sterilized under UV-light for at least 20 min. Pipet 10 μl of the conidia suspension of F. graminearum in 20%-30% glycerol from -80 °C freezer onto a V8 juice agar plate, and incubate in a 25 °C growth chamber for 3-5 days. Chop the V8 agar, now full of aerial hyphae, into small pieces with a sterilized tweezer, and transfer these pieces into 100 ml sterilized mung bean liquid medium, then incubate in a constant temperature shaker at 25 °C and 150 rpm for 3-5 days (Figure 2). Figure 2. Preparation for the inoculum of F. graminearum. A. Transfer the medium with hyphae of F. graminearum to mung bean liquid medium. B. Cultivate the liquid medium with hyphae of F. graminearum in a shaker at 25 °C and 150 rpm. 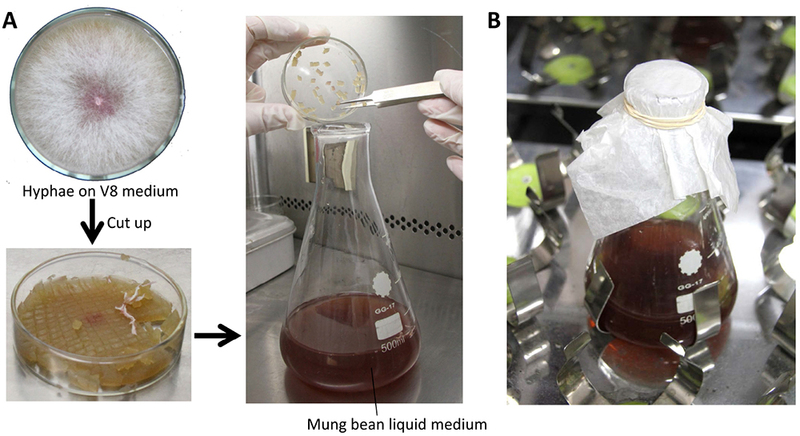 Filter the mung bean liquid medium containing F. graminearum conidia through sterile gauze to remove any remaining agar, then collect the filtered liquid medium into a sterile 250 ml-centrifuge bottle. Centrifuge at 7,500 x g for 10 min at room temperature. Discard the supernatant and re-suspend the conidia pellet in 1 ml sterile water by pipetting, then transfer the conidia suspension into the 1.5 ml sterile centrifuge tube. Wash the pellet using sterile water three times and centrifuge at 7,500 x g for 1 min until all residual red medium is removed. Resuspend the conidia pellet in about 0.5 ml sterile water (the volume of water can be adjusted according to the amount of conidia), pipet 20 μl of conidia suspension onto the haemocytometer and adjust the concentration of the conidia into 105-106/ml (Figure 3A). Note: Fresh-made conidial suspension stored at room temperature should be used within 48 h.
Maize stalk inoculation with F. graminearum conidia. Choose maize plants at V10-V11 stage (10th or 11th fully expanded leaf with the leaf collar) before anthesis for stalk infection (Figure 3B). Note: For B73, it usually takes about 5 weeks to grow to this stage. Keep two maize plants as untreated controls, and inoculate the others for experiments. Punch a small hole (about 10 mm in depth) in the stalk at the third or fourth internode above the soil using sterile tweezers (Figure 3C). Inject 20 μl of the conidia suspension (106/ml) into the hole. Note: Multiple maize plants should be inoculated in one experiment to allow at least three individual plants to be sampled per time point for observation and measurements. At least three independent experiments should be performed for statistical analysis of symptoms. As negative control, 20 μl sterile water was injected into the hole, called mock-inoculated. Wrap up the inoculated stalk with sterile gauze (Figure 3D) to retain moisture, and put it in a growth chamber (25 °C, 60% humidity, a 10 h light/day photoperiod). Note: The whole maize plant is used for stalk infections, not detached stems. Figure 3. Procedure for inoculating maize stalks with F. graminearum. A. The conidia suspension of F. graminearum for inoculation. B. The whole maize plant in V10 stage. C-D. The main steps for inoculation. Red arrow points to infect site. Yellow bar = 50 μm, Green bar = 5 cm. Conidia of F. graminearum germinate about 12 h after inoculation (hai): most hyphae grow intercellularly before 72 hai in stalks and colonize parenchymal cells around the infected site from 72 hai to 144 hai (Zhang et al., 2016). At given time-point after inoculation, maize plants were harvested, and the infected internode was split longitudinally for visual observation (Figure 4). Figure 4. Process for symptom observation. Black scale bar = 1 cm. Split internodes were photographed as to record lesion development (Figure 5). Figure 5. Representative images of the internodes inoculated by water (A) or F. graminearum (B). hai: hours after inoculation. 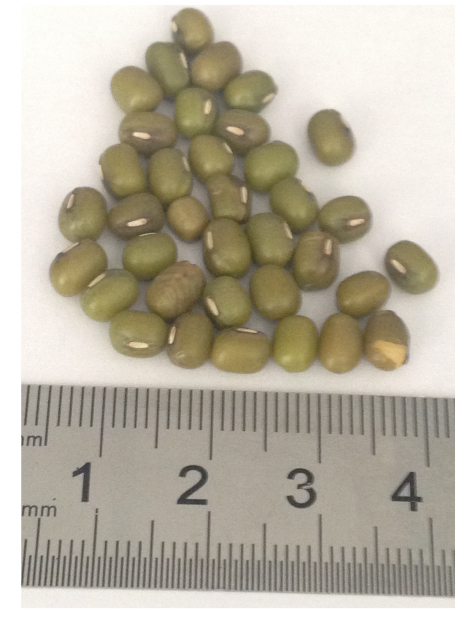 Green scale bar = 5 cm. Split the infected maize stalk along the hole, chop half of the split internode longitudinally or transversely into small slice 5-10 mm in length and width, and place it on the glass slide immersed in sterile water covered by the coverslip. A BX51 (Olympus) taken, and then fluorescence images using a filter with excitation wavelength of 450-480 nm and emission wavelength of 515 nm. Set the three basic colors ratio as red:blue:green = 1.5:1:1. The bright field and fluorescence images were merged (Figure 6). Figure 6. Compound microscopic observation of F. graminearum hyphae growing in maize stalk pith tissues. H: F. graminearum AmCyan PH-1 hyphae, exhibiting green fluorescence. Hai: hours after inoculation. Scale bars = 100 μm. Choose the two channels: channel 1 with 405 nm excitation wavelength and 460-500 nm emission wavelength is for AmCyan fluorescence of F. graminearum hyphae, and channel 2 with 405 nm excitation wavelength and 570-670 nm emission wavelength is for cell wall autofluorescence. The final images are merged by the two channels. 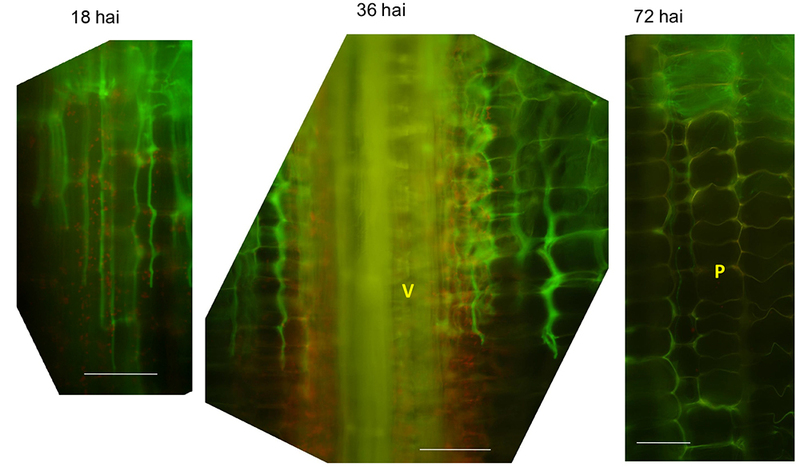 Note: Because maize stalk tissues also show autofluorescence, recognition of fungal fluorescence requires understanding of background maize signals as shown in Figure 1. For example, see Figure 7. Figure 7. Representative longitudinal section images of infected internodes at indicated time point. V: vascular bundle; P: parenchyma cells; hai: hours after inoculation. Note the autofluorescence signals from plant cell walls are stronger than in un-infected stalks. Scale bars = 100 μm. The longitudinal length of brown infected areas was measured as the lesion size at the indicated time using ImageJ software (http://rsbweb.nih.gov/ij/index.html). The average distance from the wounding line for both the top and bottom fronts of the brown area was measured as half lesion size (illustrated in Figure 8). Hyphal advancing distance was measured using a fluorescence microscope with GFP filter (Figure 8). This protocol uses horizontal wounding, instead of a 45 °C wounding angle. The horizontal protocol provides more uniform fungal growth. This protocol was modified from previous inoculation method of Colletotrichum graminicola (Tang et al., 2006). We thank Dr. Sheila McCormick for editing the protocol. The research in the Tang lab was supported by the Ministry of Science and Technology of China (Grant 2016YFD0100600), the Natural Science Foundation of China (Grant 31570318) and the Ministry of Agriculture of China (Grant 2016ZX08009-003). Jackson, T. A., Rees, J. M. and Harveson, R. M. (2009). Common stalk rot diseases of corn. The Board of Regents of the University of Nebraska. Pritsch, C., Muehlbauer, G. J., Bushnell, W. R., Somers, D. A. and Vance, C. P. (2000). Fungal development and induction of defense response genes during early infection of wheat spikes by Fusarium graminearum. Mol Plant-Microbe In 13(2): 159-169. Pritsch, C., Vance, C. P., Bushnell, W. R., Somers, D. A., Hohn, T. M. and Muehlbauer, G. J. (2001). Systemic expression of defense response genes in wheat spikes as a response to Fusarium graminearum infection. Physiol Mol Plant P 58(1): 1-12. Proctor, R. H., Hohn, T. M. and McCormick, S. P. (1995). Reduced virulence of Gibberella zeae caused by disruption of a trichthecine toxin biosynthetic gene. MPMI 8(4): 593-601. Reid, L. M., Hamilton, R. I. and Mather, D. E. (1996). Screening maize for resistance to Gibberella ear rot. Agriculture and Agri-Food Canada: Ontario Technical Bulletin: 1996-5E. Santiago, R., Reid, L. M., Arnason, J. T., Zhu, X., Martinez, N. and Malvar, R. A. (2007). Phenolics in maize genotypes differing in susceptibility to Gibberella stalk rot (Fusarium graminearum Schwabe). J Agric Food Chem 55: 5186-5193. Schnable, P. S., Ware, D., Fulton, R. S., Stein, J. C., Wei, F., Pasternak, S., Liang, C., Zhang, J., Fulton, L., Graves, T. A., Minx, P., Reily, A. D., Courtney, L., Kruchowski, S. S., Tomlinson, C., Strong, C., Delehaunty, K., Fronick, C., Courtney, B., Rock, S. M., Belter, E., Du, F., Kim, K., Abbott, R. M., Cotton, M., Levy, A., Marchetto, P., Ochoa, K., Jackson, S. M., Gillam, B., Chen, W., Yan, L., Higginbotham, J., Cardenas, M., Waligorski, J., Applebaum, E., Phelps, L., Falcone, J., Kanchi, K., Thane, T., Scimone, A., Thane, N., Henke, J., Wang, T., Ruppert, J., Shah, N., Rotter, K., Hodges, J., Ingenthron, E., Cordes, M., Kohlberg, S., Sgro, J., Delgado, B., Mead, K., Chinwalla, A., Leonard, S., Crouse, K., Collura, K., Kudrna, D., Currie, J., He, R., Angelova, A., Rajasekar, S., Mueller, T., Lomeli, R., Scara, G., Ko, A., Delaney, K., Wissotski, M., Lopez, G., Campos, D., Braidotti, M., Ashley, E., Golser, W., Kim, H., Lee, S., Lin, J., Dujmic, Z., Kim, W., Talag, J., Zuccolo, A., Fan, C., Sebastian, A., Kramer, M., Spiegel, L., Nascimento, L., Zutavern, T., Miller, B., Ambroise, C., Muller, S., Spooner, W., Narechania, A., Ren, L., Wei, S., Kumari, S., Faga, B., Levy, M. J., McMahan, L., Van Buren, P., Vaughn, M. W., Ying, K., Yeh, C. T., Emrich, S. J., Jia, Y., Kalyanaraman, A., Hsia, A. P., Barbazuk, W. B., Baucom, R. S., Brutnell, T. P., Carpita, N. C., Chaparro, C., Chia, J. M., Deragon, J. M., Estill, J. C., Fu, Y., Jeddeloh, J. A., Han, Y., Lee, H., Li, P., Lisch, D. R., Liu, S., Liu, Z., Nagel, D. H., McCann, M. C., SanMiguel, P., Myers, A. M., Nettleton, D., Nguyen, J., Penning, B. W., Ponnala, L., Schneider, K. L., Schwartz, D. C., Sharma, A., Soderlund, C., Springer, N. M., Sun, Q., Wang, H., Waterman, M., Westerman, R., Wolfgruber, T. K., Yang, L., Yu, Y., Zhang, L., Zhou, S., Zhu, Q., Bennetzen, J. L., Dawe, R. K., Jiang, J., Jiang, N., Presting, G. G., Wessler, S. R., Aluru, S., Martienssen, R. A., Clifton, S. W., McCombie, W. R., Wing, R. A. and Wilson, R. K. (2009). The B73 maize genome: complexity, diversity, and dynamics. Science 326(5956): 1112-1115. Tang, W., Coughlan, S., Crane, E., Beatty, M. and Duvick, J. (2006). 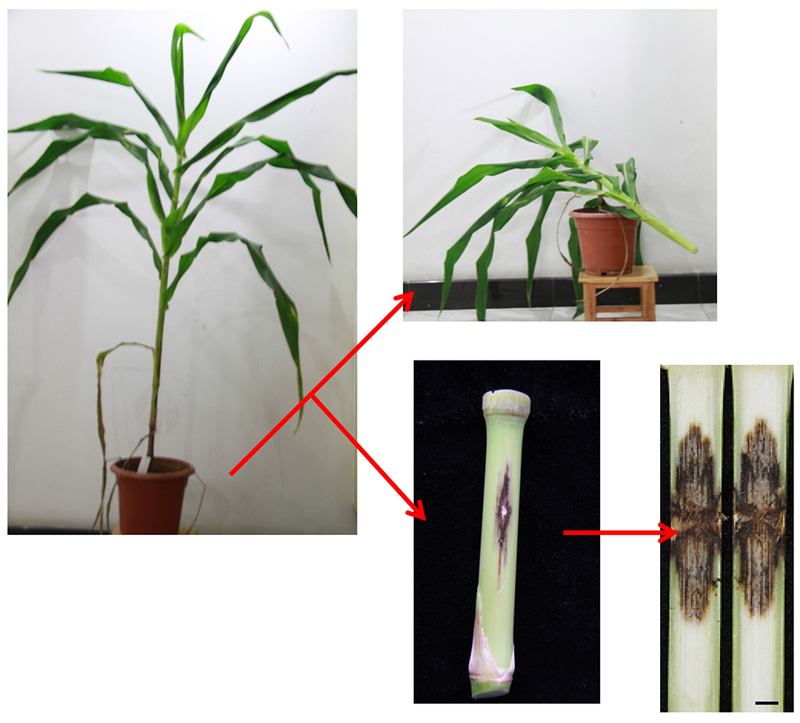 The application of laser microdissection to in planta gene expression profiling of the maize anthracnose stalk rot fungus Colletotrichum graminicola. MPMI 19(11): 1240-1250. Yang, Q., Yin, G., Guo, Y., Zhang, D., Chen, S. and Xu, M. (2010). A major QTL for resistance to Gibberella stalk rot in maize. Theor appl genet 121(4): 673-687. Yuan, T. L., Zhang, Y., Yu, X. J., Cao, X. Y. and Zhang, D. (2008). Optimization of transformation system of Fusarium graminearum. Plant Physiol Commun 44:251-256. Zhang, X. W., Jia, L. J., Zhang, Y., Jiang, G., Li, X., Zhang, D. and Tang, W. H. (2012). In planta stage-specific fungal gene profiling elucidates the molecular strategies of Fusarium graminearum growing inside wheat coleoptiles. Plant Cell 24(12): 5159-5176. Zheng, D., Zhang, S., Zhou, X., Wang, C., Xiang, P., Zheng, Q. and Xu, J. R. (2012). The FgHOG1 pathway regulates hyphal growth, stress responses, and plant infection in Fusarium graminearum. PloS one 7(11): e49495. Zhou, X., Heyer, C., Choi, Y. E., Mehrabi, R. and Xu, J. R. (2010). The CID1 cyclin C-like gene is important for plant infection in Fusarium graminearum. Fungal Genet Biol 47(2): 143-151.